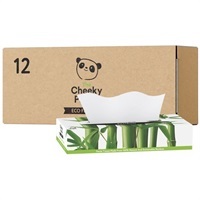 Cheeky Panda Luxury Flat Box Facial Tissue is made from 100 percent natural sustainable bamboo. Bamboo is hypoallergenic and super kind to skin. The beautifully soft, luxuriously facial tissues leaves your skin feeling refreshed every time. Designed for easy usage and storage.